With the deployment in the 1950s of atomic weapons on both sides of the Cold War, all three branches (Army, Navy, Air Force) of the U.S. military sought to justify fielding nuclear weapons within their individual arsenals. For the U.S. Army, prior to the refinement of tactical nuclear missiles, that meant developing an atomic artillery piece. This weapon was the M65 280mm Motorized Heavy Gun, also known as the Atomic Cannon. In May of 1950, the Watervliet Arsenal began designing the 280mm Gun T131 for the U.S. Army. This heavy, mobile, long-range gun was developed to fire the W-9 15 kiloton atomic 280mm Projectile T124. 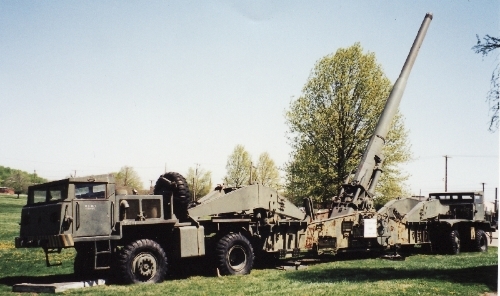 By the spring of 1951, the first T131 gun was mounted on the T72 Gun Carriage, and in October, 1952, three T131 guns were demonstrated to the U.S. public at Aberdeen Proving Ground. From 1951 to 1953, 20 guns were manufactured by the Dravo Corporation, based in Pittsburgh, Pennsylvania. The weight of the gun and carriage was 94,000 lbs/42,582 kg, (47 tons). The length of the gun carriage was 38'-5" or 11.71 meters. The gun could be emplaced and set up for firing in approximately 12 minutes, and returned to the traveling mode in approximately 15 minutes. The publicly-acknowledged maximum range of the 280mm gun was 20 miles, hitting within 20 yards or less of the desired target. An Army veteran assigned to M65s in Okinawa reported the actual maximum range was 35 miles. In 1950, the Kenworth Motor Truck Company began the manufacture of the M249 4x4 Heavy Gun-Lifting Front Truck and the M250 4x4 Heavy Gun-Lifting Rear Truck, to transport the T131 Gun. From 1952 through 1953, 33 Front and 33 Rear Trucks were manufactured. Each truck was powered by a Continental AO-895-4 six-cylinder engine, with a maximum output of 375 hp and a top speed of 45 mph. The empty weight of the M249 Front Truck was 37,950 lbs/17,191 kg (19 tons); the empty weight of the M250 Rear Truck was 35,910 lbs/16,267 kg (18 tons). 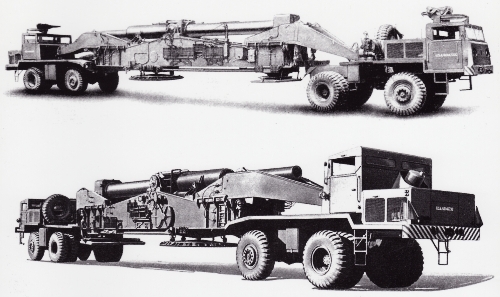 The entire assembly of two trucks and one gun was designated the M65, although the unofficial, popular name given this machine was "Atomic Annie." Total weight of the M-65 was 172,865 lbs/78,308 kg (86.4 tons). The two trucks were operated by two drivers, and the Front Truck driver could be given control of the brakes in both trucks. Communication between drivers was by a system of headset intercoms. Total length of the M65 was 85'-0"/26 meters, and width was 10'-0"/3.12 meters. The 20 M65s were deployed primarily in West Germany, with six units deployed in Okinawa. The M65s were operational from 1953 to 1963, when they were replaced due to the availability of nuclear shells for the simpler, cheaper, more operationally flexible 8" howitzers, as well as by the Army's new tactical nuclear-armed missiles such as Corporal, LaCrosse and Honest John. Most of the M65s were scrapped, although a few have been preserved as museum pieces, such as at The Armored Fighting Vehicles Museum at the U.S. Army Aberdeen Proving Ground in Aberdeen, Maryland, and at The National Museum of Nuclear Science & History in Albuquerque, New Mexico. 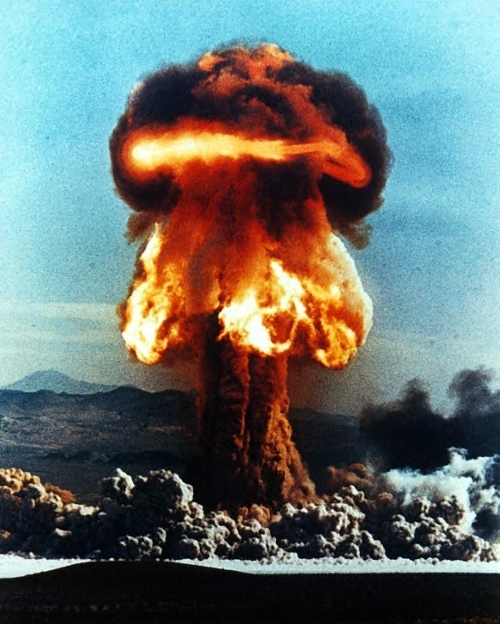 On May 25, 1953, at 8:30 am, as the tenth of a series of eleven nuclear test firings during Operation UPSHOT-KNOTHOLE, T131 number 9 fired a W-9 15 kiloton warhead (shot GRABLE) a distance of seven miles. The device detonated at an altitude of 524 feet above the target in Area 5 (known as "Frenchman Flat") on the Nevada Proving Ground. This was the only nuclear firing of the M65. The image above is a movie frame recording that nuclear detonation.